Using Adept SDK to handle JTAG on ZC706 board: problems. I control execution of the code with LeCroy logic analyzer and when I look at waveforms I feel a little embarrassed: 1st step is visible while 2nd - not at all. I have not worked with the ZC706. With that in mind here is the Adept 2 Reference Manual. Here is the Vlab that looks to be using the ZC706 that might be helpful. Here is a forum thread about using the ZC706. Have you looked through the PDF documents in the Adept SDK folder? Have you looked through the PDF documents in the Adept SDK folder? Sure, I did it ... and examined two examples dedicated to JTAG control. Here the problem does not concern a particular development board (ZC706 or one else). Xilinx development boards let's say medium range (probably also "high-end" boards) use Digilent JTAG-SMTx modules as principal programming interface (at least ZC706 (Zynq-7045) and KCU105 (Kintex Ultrascale) that I'm working with, use JTAG-SMTx). So, the problem concerns rather manipulating of the JTAG-SMTx using Adept SDK. As I showed in my previous mail, the 1st function call (DjtgPutTmsBits) produces activity on JTAG lines (TCK and TMS) while 2nd function call (DjtgPutTdiBits) has no any effect. And yet my control sequence is done in full compliance with table 6-2 of the example taken from the Xilinx Series 7 configuration guide. So, either the sequence from table 6-2 is erroneous, either I misinterpreted it with Adept SDK and 1st function call (DjtgPutTmsBits) didn't put JTAG TAP controller in Shift-IR state, the state where CFG_IN instruction is executed. 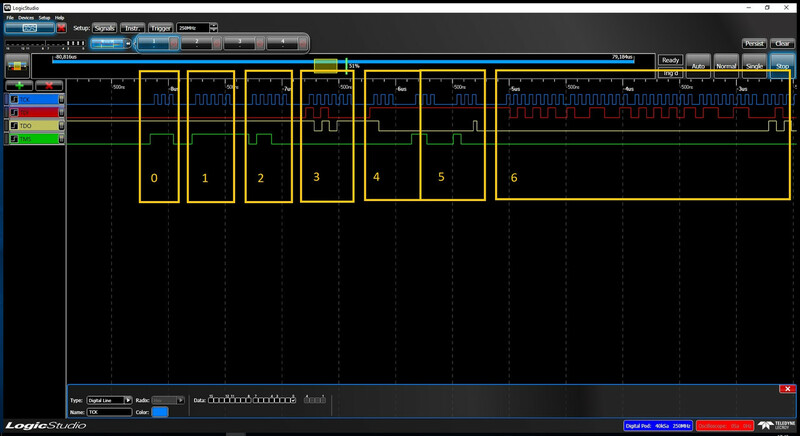 As you can state from waveforms in LeCroy Logic Studio software (I connected the probes of LeCroy logic analyzer directlly to the JTAG ports of JTAG-SMTx) the DjtgPutTdiBits call (2nd function call) has no any effect ... even on TCK line I don't see any pulse. 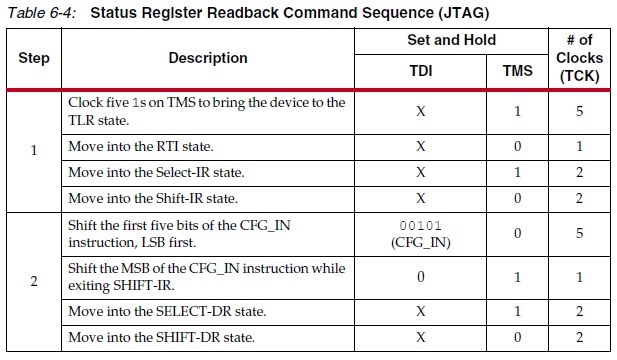 I'm curious as to why you chose your implementation of the DjtgPutTdiBits that you kept the TMS pin at a high state (second parameter in the function) when the table 6.2 states you need to keep the TMS line in a low state and why you are attempting to shift in 6 bits when the beginning of the second step only requires 5 bits which seem to be 00101. Based on your declared shft_CFG_IN array, you also seem to be wanting to shift in 3 bytes worth of data rather than the total of 10 bits for the second step. To be fair, I do not know why you do not see anything on the TCK line; I do not know if that is due to how JTAG expects things to be done or if it is because you have extra bits left over in the byte that are not being shifted in. just had a thought on this: Is it possible that the 2nd command is simply off-screen? The clock is 10 MHz so this is clearly generated on the board on a 100 ns grid. But I'd expect that different commands in the SW will go each in its own USB (micro)frame, putting them on a 125000 ns grid or slower. The reference manual mentions "selectable clock frequency" - I'd simply try to run this at 8 kHz instead of 10 MHz. Yes, it was exactly the case ! The time laps between 2 consequent function calls are so long (why ?) that the 2nd call occurs outside of the time scope, covered by LeCroy software. So, executing each instruction separately, I can control what is going on at JTAG lines. I can control executing of the each instruction separately using LeCroy software. According to my observation the ensemble of these sequences corresponds to the "golden sequence" that I picked form executing fpga -config-status instruction in Xilinx SDK that is supposed to do the same thing. 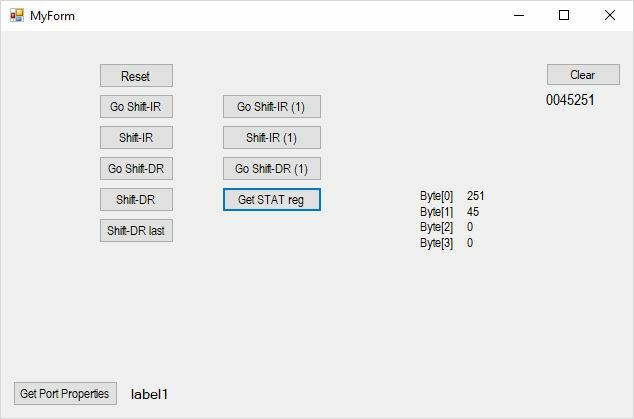 Despite the fact that both sequences (picked from execution of my code and that, picked from execution of fpga -config-status), the result is not the same: I display the content of the FPGA status register in lbl_Byte0_val ... lbl_Byte3_val windows form controls ... and can state that this value (unfortunately) is quite different from that, obtained from fpga -config-status. another thing just came to mind: You're dealing with a Zynq, there are two devices in the JTAG chain (the ARM and the FPGA). What I mean is, send 0xFFFFFFFF... to IR (repetitions of standardized BYPASS opcode 6'b111111), then send 0x01 to DR.
For a single device the response is 0x02 (one device => one register delayed). For Zynq it's 0x04 (two devices). I'm afraid I didn't properly understand what you mean. If I push BYPASS code into IR, how it will help me to resolve the problem ? In the "golden sequence" (i.e. fpga -config-status) I don't see. So, if my comprehension is correct, digilent utility dadutil doesn't see Xilinx chips? I've tried it on two boards: XC706 (Zynq-7045) and KCU105 (Kintex Ultrascale) and the result is the same. 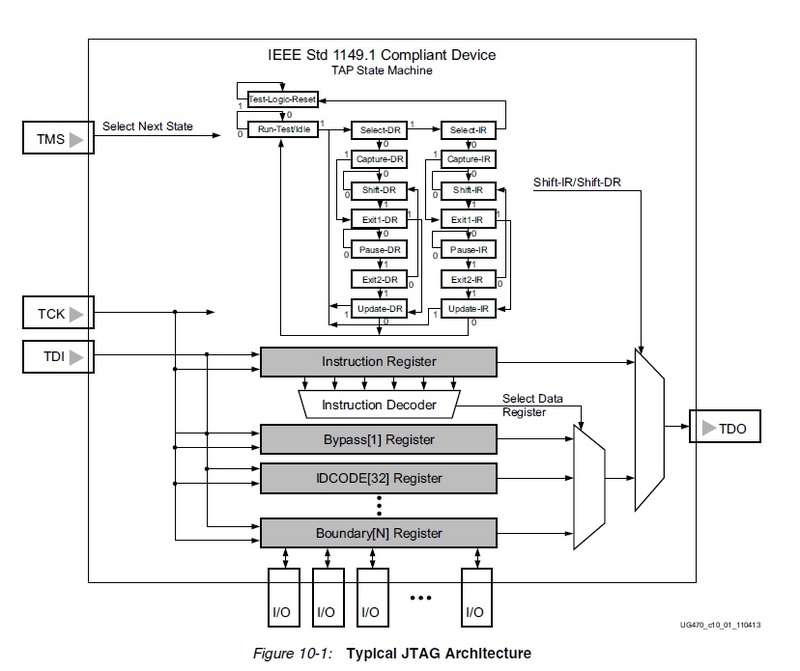 I think there are two devices in the Zynq JTAG chain: First the ARM processor, then the 7-series FPGA. The easiest way to see this is in Xilinx hardware manager: Just plug in the Zynq board, "open hardware" (near "generate bitstream") and "auto connect". It'll show the JTAG chain with ARM at index 0 and FPGA at index 1. The ARM processor has an instruction register length of 4 so I believe we need to send 10 bits into the combined IR to get IDCODE working (not 6, as for a standalone Xilinx FPGA). you'll probably have to put the ARM processor into BYPASS to do anything useful via JTAG with the FPGA. My bet is that most developers would first bring up the BYPASS opcode and not move on, until it works as expected. Probably have a reason. After a closer look to the "golden waveforms" I see that it doesn't correspond to 100% to the sequence,described in the table 6-2 of UG470. phase 5: given that the phase 4 ends up in Exit1-IR state (TMS = 1 on last pulse) TAP controller goes (through Update-IR, RTI, Select-DR, Capture-DR) to the Shift-DR state. phase 6: being in the state, te TAP controller starts to inject configuration packets into DR register starting from synchronization word 0xAA995566. So if this analysis is correct I just need to insert addition shift of 4 bits into IR register ? Do you have any idea about result of execution of dadutil command ? I did a quick experiment: My Artix-based bitstream uploader works just fine with a Zynq if I pad every 6-bit IR word with another 4 zero bits. "0000" for the arm is invalid, which is equivalent to BYPASS (doesn't matter for the uploader since it's not trying to read). Note, I have one reply above awaiting moderation (for unknown reasons, it's strictly technical). I've compared the output of my program with the "golden" result, obtained from the execution of the fpga -config-status instruction. And it's the same !! !